On the morning of January 12, 1944, two employees of Colony Bowling Alleys were cleaning pins with naphtha and a wood grinder when sparks set off an explosion. One of the men ran to No. 23 engine house and turned in an alarm. It took five hours to bring the fire at the Colony Shopping Center under control. 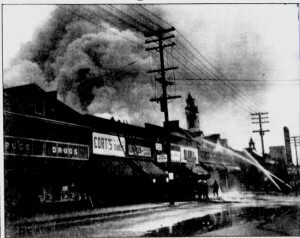 It was one of the biggest fires in Toledo’s history up to that point, and it was the first in a series of fires that plagued Toledo’s first “suburban” shopping center where Monroe Street met West Central Avenue. The Colony burns on January 12, 1944. Fireman James P. Fakeheny, 30, of No. 17’s engine house, lost his life when he was pinned in a basement by a slab of concrete. Twelve other firefighters were injured as well as two patrolmen and a civilian. Damage was $504,200: a lot in those days. The next day, Mayor Michael DiSalle called for an investigation of the city’s fire code after Fire Chief Fred Schlorf declared the fire was one of the most difficult he had ever fought because of the building’s construction. “Most of the ceilings on the stores had some kind of corrugated paper to deaden the sounds from the bowling alleys,” the chief was quoted as saying. In addition, the walls between stores did not extend through the ceiling, so cross timbers carried the fire “with a speed firemen could not cope with,” the chief said. 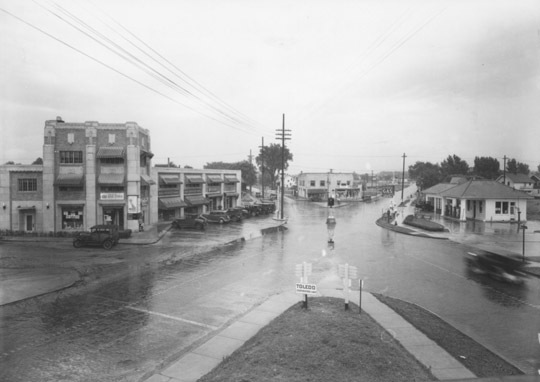 Business damaged included Woolworth’s, Kroger’s, Harry’s Auto Store, Colony Food Market, Colony Bowling Alleys, a state liquor store, Allan’s Dress Shop, Kay Shoe Shop, Fanny Farmer, Balduf’s Bakery, and Dreyer’s Soda Grill. The Colony opened sometime in or around 1941. It was tough to track down, but I did find a 1941 story mentioning Cleveland realtor Hugo S. DeGroot, “who holds a one-third interest in the new commercial development in Central Avenue, near Monroe Street.” (A link below details the Colony Theater opened in October, 1941, so I settled on that as the most accurate date. It’s not an exact science). – Brauer’s Delicatessen, located right on the corner of Central and Monroe. For some reason I am thinking bright pink neon on the sign. It opened in 1950 and closed quietly in the summer of 1995 according to this 1995 Homer Brickey article. For almost thirty of those years it was owned by brothers Irwin and Boris Brauer, who catered to the large Jewish population in the West Toledo-Kenwood area. They sold the business in 1978. Irwin died in July, 1980 and Boris died a month later after suffering a heart attack while in the restaurant’s parking lot, where he was serving as a consultant to the new owners (link). – The Colony Restaurant. I found a lot of information about it, except when it opened and closed. It was always kind of an inside joke, however, that the Colony was a Chinese-owned restaurant that served strictly American food. Jimmy Yee and Eddie Lee ran the restaurant for years until Bessie and Wing Lee took it over in 1968. This 1963 article by Mary Alice Powell cited the restaurant’s French onion soup, noting twenty gallons of it were brewing 24 hours a day, and according to this 1981 review (again by Mary Alice), it was still a class place, which is how I remember it as a child. It was heavily damaged in a 1983 fire. 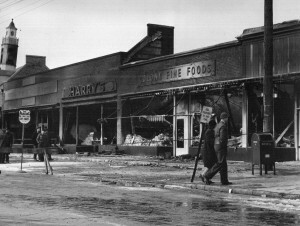 Aftermath of the 1941 Colony fire. From the Toledo Lucas-County Public Library’s “Images in Time” website. 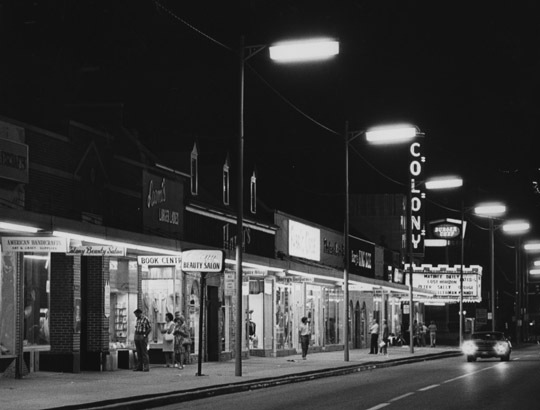 And then there was the green neon of the Colony Theater, where I saw a lot of Disney movies as a child. It opened in October, 1941 and closed in July, 1981 according to this story, due to declining attendance. It was pretty well regarded as the first nice suburban movie theater, before Showcase Cinemas moved in a couple miles away on Secor Road (in fact, National Amusements, owner of Showcase Cinemas, owned the theater when it closed). And guess what? It had a fire too, in 1984, but investigators found later it had been deliberately set. By 1991, the center was nearly empty, and much of it was razed after Toledo Hospital announced plans to build a $5.5 million lab on the site. 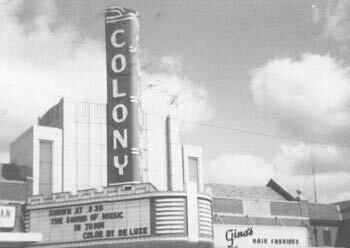 Here is a nice but pretty heavily watermarked photo of the Colony Theater from cinematreasures.org. Update: Finally, on May 30, 2013, two years after this original post, a story in The Blade reported that demolition had started on what was left of The Colony. So The Colony is no more. Anybody remember Scotty’s Fish and Chips on Upton Ave Toledo 1950’s? We used to do the $1 Marx Brothers movies at the theater. Oh, and the pizza. Geno’s/Gino’s? Yum!